Cardio to burn fat that must be aerobics exercise! Pack a T-shirt and shoes to exercise, its aerobics time. The first and last exercise routine for weight loss. Aerobics exercise may seem like a thing of the past but like exercise that never diet such as yoga and good old walking, aerobics is an excellent venue for people to get back into exercise burning fat putting in time doing cardio. Is aerobics good cardio to burn fat? Aerobics is a great way to burn fat and when combined with a healthy diet makes an excellent tool for losing weight dieting and exercising. In addition to being such an effective Aerobics Exercise, it doesn't have a steep learning curve. That means even for beginners getting started is easy and the rest is enjoying the feeling of exercise burning fat. Like other aerobic exercises, aerobics continued over long periods of time has been shown to reduce fat in the blood, triglycerides, allowing you to burn off fat during exercise. Other types of aerobic exercise are walking, swimming, and cycling. On the other hand, weight training and sprinting is considered anaerobic exercise. In this diet Slism, we discuss aerobics exercise intended for beginners just thinking about doing aerobics but are not sure of where to start looking. Here you will find tips to get started with aerobics as well as benefits to add to your checklist of ways to get slim. What first comes to mind when discussing aerobics is step aerobics, aqua aerobics, or dance aerobics. The term aerobics is also used interchangeably with the term aerobic exercise. Aerobic exercise can be done at home at you own pace are at the gym with the guidance of a professional instructor. Aerobics is an aerobic exercise where you dance while exercising. Moving in all directions, jumping, running, these movements are all included in aerobics exercise. When you are not sure what to do with your arms and legs, just follow the movements of your aerobics teacher. It's that easy! While doing aerobics exercise there is rest time set aside for rehydrating. At the very least you want to keep moving for 15 minutes before taking any breaks. This helps you reach the fat burning zone of aerobic exercise. Note that most aerobics exercise routines includes increments of light weight training and stretching. This is to ensure more reach in your fitness plan if all you are doing is aerobics. Where Can Aerobics Be Done? The standstill location to do aerobics exercise is at your local sports club or fitness gym. Not all fitness venues will offer aerobics classes so it is important to double check before signing up that the club you are going to join offers aerobics exercise. Depending on the intensity of your aerobics class the difficulty to follow your instructor should vary. Entering aerobics for beginners shouldn't have trouble keeping up. On the other hand, intermediate to advanced aerobics may require a little effort on your part. What about aerobics exercise at home? Although you may think at first that aerobics have to be done at a dance studio, aerobics instructional videos can be found online or purchased on DVD or Blue-ray for use at home. That means you can get aerobics exercise done without leaving your house. The only precaution you need to make is not to get distracted while exercising. It is easy to stop in the middle and drop aerobics all together. That's one problem with exercising along especially in front of a TV that beckons doing something more leisurely. In the same way you would follow your fitness instructor at the gym or sports club, pay special attention into the instructor featured in the video you are using to get in aerobics for free at home hammering down your form. For people not able to make the lengthy commute required to the dance studio or have kids, doing aerobics exercise at home is recommended. Set aside a time that you can concentrate on doing aerobics. Most of the image you get when thinking about aerobics is the dance studio scene filled with men and women wearing black tights under ruffle-stuffed blue short pants and a white head to keep sweat from running down your face. However, in reality it is much simpler. All you are going to need is a T-shirt and some trunks, or whatever you are used to wearing when working out, unless told otherwise by your instructor. Just because there is no real required equipment to start up with aerobics, doesn't mean it doesn't help to be prepared. Always bring a pair of shoes and something to drink, preferably water, or a refreshing sports drink, to aerobics. Aerobics exercise programs don't start you off doing high intensity exercise. However after stretching, there is a gradual increase intensity that you need to be aware of. Even though you aren't expected to hit the ground running in aerobics that doesn't mean you should skip out of doing bread and butter warm up exercises. Giving yourself time to warm up before starting into aerobics not only prepares your body for an increased load of exercise intensity but help you burn fat faster subtracting from the time required to reach the fat burning zone. There are many benefits of doing aerobics exercise such as building up aerobic endurance that helps you move on to other more exciting areas of aerobic exercise and burning fat that helps you slim down. It is not saying much that while doing aerobics you will be building up capacity in your lungs. This not only makes it easier to breath but fires up the hidden endurance in your body that are going be handy for long treks. With increased aerobic endurance and stamina, there is less of a worry that you lose your breath exercising. After 15 minutes of uninterrupted aerobic exercise you may be thinking about taking a water break. That's fine, but just know that after 20 minutes your body kicks it into gear entering what is called the fat burning zone. After reaching the fat burning zone it is time to start turning up the heat burning fat like you can't achieve in anaerobic exercise. Most aerobics exercise programs start of doing routines up to 30 minutes. 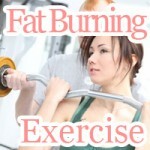 This is to ensure best results in fat burning. As you already know, the secret to reaching the fat burning zone is getting across the 30 minute wall required to hurdle before turning into a fat burning machine. For people just getting started who are looking for the true aerobics experience, taking a class from an instructor is a definite must. This way even though you don't know the steps there is someone there to stop you and show you just how it is done. Honestly speaking, aerobics just getting started out is not as easy as aerobics videos make it out to be. You are going to sweat. You are going to feel a burning sensation run throughout your body. That's okay though because in the meantime, you will possibly feel the best you have in ages. When thinking about jumping into more advanced forms of aerobic exercise, you may want to consider joining a fitness gym, sports club, or in other words get in on group fitness. Exercising with peers not only help you keep on track but is said to be much more enjoyable than exercise alone. Most importantly, it is best to start of modest always making sure not to push yourself too hard until ready to turn up the heat like you mean it. Burn fat and lose weight with step aerobics. Not only is it free to get started but is perfect for people not used to exercising regularly. Are you ready? 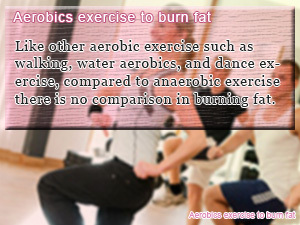 Like other aerobic exercise such as walking, water aerobics, and dance exercise, compared to anaerobic exercise there is no comparison in burning fat. After 30 minutes of continued aerobic exercise you hard work pays off because you are now in the zone. The fat burning zone! 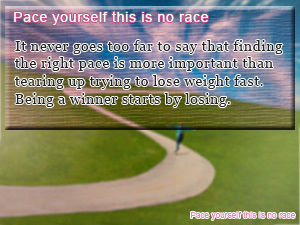 It never goes too far to say that finding the right pace is more important than tearing up trying to lose weight fast. Being a winner starts by losing.